This is the frightening moment unarmed police found themselves staring down the barrel of a gun as they tried to question a man in Preston. Officers, who had followed the 29-year-old onto the driveway of an address in Ribbleton, bravely tackled and disarmed him. 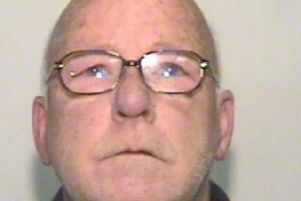 Today Ashley Gerrard, of Bruce Street, St Helens, was jailed for more than six years by a judge at Preston Crown Court. The court heard police were called to a domestic incident in Mill Lane, Coppull at around 10.30am on December 22. Reports suggested the man had made off from the address and officers later followed a Ford Focus as it turned onto the drive of a house in Ribbleton Avenue, Preston. As the driver got out of the car, he pointed a handgun at officers and pulled the trigger. Fortunately the weapon did not discharge and no-one was hurt. After a brief chase down the side of the property Gerrard was detained. A firearm was recovered and was later shown to be an imitation 8mm black and silver handgun. Gerrard was charged with possessing an imitation firearm with intent to cause fear of unlawful violence and possession of an imitation firearm with intent to resist lawful arrest. At an earlier hearing, he pleaded guilty to possession of an imitation firearm, as well as to separate charges of assault and dangerous driving relating to other cases. Detective Sgt Mark Riley, of Preston Police, said: “These officers showed incredible bravery in detaining this man after having a firearm pointed at them and it was fortunate that no-one was seriously hurt.